Clickit Realty is a licensed real estate brokerage in the State of New York. 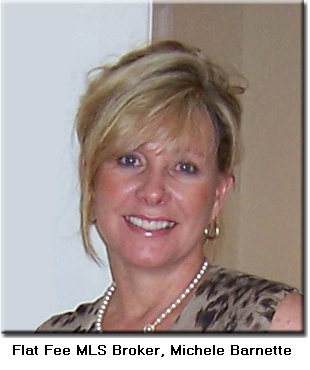 Owner and Broker Michele Barnette, is well known in the industry and is the Direct MLS provider for New York State! We offer a Flat Fee – Limited Service product to Sellers looking to sell their home, save money and have direct control of the sale. We have membership in 19 MLS associations (that syndicate to hundreds of consumer sites). This huge footprint allows us to market to local Realtors® throughout the entire state AND on the top three consumer sites, nationally! Clickit Realty has taken all of the traditional tools that the Listing Agent brings to the table when listing a home, created a menu of tools, and then let the Seller purchase the tools that they actually need or want to market their home. These tools include placing their property into their local Multiple Listing Service (MLS), providing signage, flyers, photographs, virtual tours, lockboxes, assist with negotiations, CMA’s, Realtor.com® advertising, as well as exposure on a host of other real estate websites being used by 87% of consumers looking to purchase a home in today’s market. This visionary and entrepreneurial business model was introduced by Broker, Christopher Ballard and Broker, Richard Williams in April, 2000. They literally broke ground with this innovative system to provide Sellers a way to have better negotiating room, net more money at closing, or pay a higher Selling Broker commission because they do not pay a Listing Broker commission at closing. We have been proud to work with them to develop the Clickit Realty (sister) company since its inception. Clickit Realty has mastered a system to manage the Seller’s listings from a marketing standpoint to allow them to focus on selling their property. Our Award Winning service is unmatched in the industry! Clickit Realty is professional and knowledgeable about the Real Estate market. I have been recognized for various achievements. I work hard for these achievements because I take our business seriously and truly care about the customers! I look forward to assisting you in selling your home!